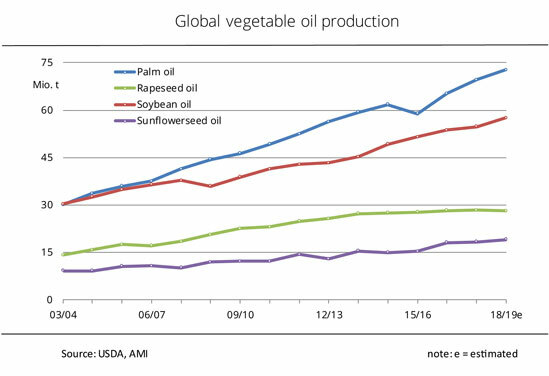 In Washington, according to the USDA forecast, 2018/19 world vegetable oil production will probably rise more than 3 per cent from the previous year to a record level of just less than 204 million tonnes. Palm, soybean, rapeseed and sunflower oil account for around 87 per cent of that figure. Soybean oil is expected to see the biggest growth at 5 per cent. The development benefits from ample availability of feedstock from the 2018 bumper harvests of soybeans in Brazil and the US and continued buoyant international demand for processed soybean products. Favorable growing conditions in Southeast Asia and surprisingly high yields on palm oil plantations are seen to lead to a 4.5 per cent rise from 2017/18 to 72.8 million tonnes. Production of sunflower oil is expected to rise 4 per cent, because Ukrainian sunflower production is up around 6 per cent from a year earlier. By contrast, 2018/19 output of rapeseed oil of 28.1 million tonnes is projected 1 per cent lower than in the 2017/18 marketing year. According to Agrarmarkt Informations-Gesellschaft mbH (AMI), the reason is drought-induced disappointing rapeseed harvests in the EU-28 and Australia in 2018.